(CNN) — Facebook’s decision to file for public status last week means its No. 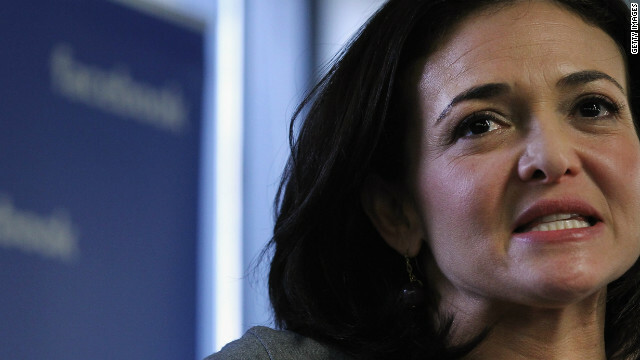 2 executive, Sheryl Sandberg, might be worth as much as $1.6 billion. According to Forbes, that would catapult her just below the seemingly untouchable Oprah in the ranking of the richest self-made women. She won’t have much company: Only 7.5% of the major earners at America’s Fortune 500 companies are female. The many media profiles of Sandberg all seem to be asking the same question: How did Sheryl do it? How did she get the confidence to perform so well at such a high level? And perform she has. According to The New York Times, she took Facebook from 70 million users and no business model to profits reaching $1 billion on $3.7 billion in revenue in just four years. Sandberg’s own mentor, Larry Summers, ignited a firestorm in 2005 when he wondered publicly whether one reason women weren’t achieving at the highest levels in the sciences was a lack of biological aptitude, particularly for math. Before long, he was ousted from his position as president of Harvard — not officially for this reason — and the nation was abuzz about women’s lack of parity in so many fields and forums.